Indian Lake: “Fishing tournament capital of Ohio? Indian Lake is a fishing mecca with over 50 tournaments a year. There’re called “fishing tournaments,” “tournament trails” and “fishing circuits.” They’re prestigious and popular and they’re all around the state of Ohio and America. Little known to many though is the fact that Indian Lake hosts over 50 of these fishing tournaments a year between April and October. That’s a lot! These are top-notch, official fishing tournaments registered with the state and hosted by Indian Lake State Park. They bring a significant economic impact to the lake and its communities. The tournaments bring people to Indian Lake who spend money at campgrounds, bait shops, cottage rentals, restaurants and stores. Indian Lake is a great fishery with abundant fish and size. It has always been a very popular lake to fish and known as a great fishery for bass, saugeye and crappie. It attracts thousands of recreational anglers every year. What most are unaware of are all the fishing tournaments being held here annually. When you think of Indian Lake what usually comes to mind is boating, parties on the beach, recreational fishing, lake houses and festivals. But, actually one of the most popular attractions at Indian Lake is it’s impressive, staggering list of annual fishing tournaments the lake is host to. Some of the popular tournaments that have already taken place this year include the Ohio Megabass Tournament, Ohio Bass Federation, Buckeye Bass Elites, Mid Ohio Saugeye Trail, and the American Bass Anglers. Popular tournaments coming up include the Indian Mid-Ohio Anglers, FLW, Trophy Bassmasters and the Mid-Ohio Championships. 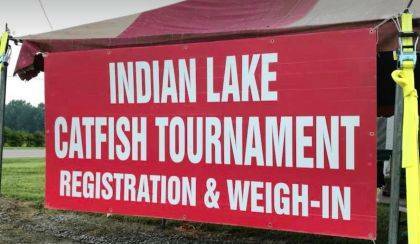 The 23th Annual “Indian Lake Catfish Tournament” sponsored by Indian Lake Outfitters took place just this last weekend with a total guaranteed purse of $7500. Most tournaments are catch and release.